Career choice was explored at an information session held by the IDC at one of its adopted schools in Free State, Kgabareng High School. The other IDC adopted school in the province, Ngwathe Secondary was also invited. Seventeen-year-old Dimpho Mofokeng from Kgabareng High School wants to be a corporate lawyer one day and a career information session held by the Industrial Development Corporation at her school assured her she had chosen the right path. A Grade 12 learner who seems to have a well-planned future, Mofokeng said the career information session held on Friday, 8 August was an eye-opener. She came away determined and confident that she was on the right track. It was the first of a series of sessions to be conducted at identified adopted schools and involved speakers from the IDC’s Human Capital and CSI Division, the Adopt-A-School Foundation and the Department of Social Development. The information sessions are meant to, among other things, provide students with information about the various careers available beyond matric, as well as demystify the fields related to science, technology, engineering and maths. 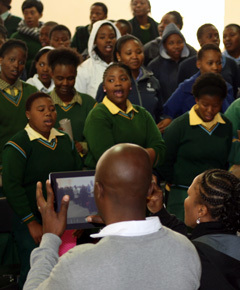 The information sessions are a result of challenges that the IDC identified in its adopted schools; they found that most learners were found to have limited knowledge of post-school opportunities and that some lacked the self-esteem to even consider university as an option due to their socio-economic backgrounds. “The speakers from the IDC and the Department of Social Department were very helpful, guiding us on which careers to choose and on what basis,” said the feisty Mofokeng, adding that she had already applied for a place at North West University (Potchefstroom Campus) to study law. Located in the township of Rammulotsi, in the Free State town of Viljoenskroon, Kgabareng High School is one of 20 schools across the country that the IDC has adopted under its Whole School Development Programme. The programme is a holistic and sustainable model of improving schools through addressing infrastructure and curriculum challenges as well as the social environment over a period of time. It is implemented by the IDC’s CSI Division in partnership with the Adopt-A-School Foundation, a non-profit organisation. In addition to the Whole School Development Programme, the IDC has a bursary programme for learners who are academically talented but lack financial resources to pursue law, commerce, science and engineering studies at tertiary level. The bursaries awarded to top performing matric learners from adopted schools to study at institutions of their choice across South Africa cover tuition, accommodation and study material such as books. Furthermore, bursary recipients get psycho-social support while studying to help them cope with their new environment at university. Kgabareng High School has an enrolment of 700 learners and 26 teachers. In 2012, the school had a 70.1% matric pass rate, rising to 95.6% in 2013. “The school used to perform dismally before 2012. But as you can see we have been working very hard with the help of the IDC to improve the results. We are determined to reach the 100% pass rate this year,” said principal IT Taje. The school offers technical subjects such as maths, accounting, commerce, business studies, geography, economics and life sciences. Taje said most learners faced “challenges” with maths and science, and the school worked very hard to improve results in these subjects. Besides helping improve infrastructure at the school, he added that the IDC helped improve the performance of its leadership, including the principal, teachers, school governing body and representative council of learners. Pupils from another adopted school, Ngwathe Secondary School in Edenville, also in Free State, also attended the career information session. Thabo Thulo said he was interested in doing a learnership after completing matric. “I want to be an artisan but I haven’t decided which craft exactly to pursue. I am also interested in what speakers from the Department of Social Development presented about how to become a social worker. That’s my second choice of career at the moment,” said the eighteen-year-old Grade 12 learner. Kefiloe Fokase, the project co-ordinator of the Department of Social Development’s scholarship programme, said it was essential to partner with institutions like the IDC and Adopt-a-School Foundation because a programme like the Whole School Development Programme dovetailed into its bursary scheme as well. “We also have five schools per year that we have adopted and we wish to extend this partnership with the IDC to help reach our targets,” she said, adding that the department will sponsor studies for learners registering to study social work at a university of their choice.